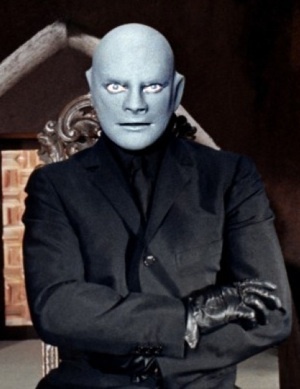 After the tremendous popular success of the Fantômas novels, both of the major French film studios—Pathé and Gaumont—vied for the rights to produce films based on the series. Gaumont won, and from April 1913 to May 1914 Louis Feuillade directed five Fantômas films which critic David Thomson has described as "the first great movie experience." Kino Films has released a three-DVD set of Louis Feuillade's brilliant Fantômas serial with English subtitles. See below for credits and release dates; click on the film titles for synopses and stills. Fantômas. Serial in three episodes. Released April 1913. Produced by Gaumont Studios. Directed by Louis Feuillade. Cast: René Navarre (Fantômas), Edmond Bréon (Juve), Georges Melchior (Jerôme Fandor), Renée Carl (Lady Beltham); plus Jane Faber (Princess Danidoff), Naudier (Nibet), Volbert (Valgrand). 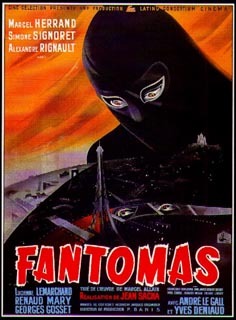 Film version of the first Fantômas novel, Fantômas. Juve contre Fantômas (Juve versus Fantômas). Serial in four episodes. Released September 1913. Credits as above. Cast: as above; plus Yvette Andreyor (Josephine). Film version of the second Fantômas novel, Juve contre Fantômas. Le mort qui tue (The murderous corpse). Serial in six episodes. Released November 1913. Credits as above. Cast: as above; plus Jane Faber (Princess Danidoff), Naudier (Nibet), André Luguet (Jacques Dollon). Film version of the third Fantômas novel, Le Mort qui tue. Fantômas contre Fantômas (Fantômas vs. Fantômas). Serial in four episodes. Released February 1914. Credits as above. Film version of the sixth Fantômas novel, Le policier apache (The thug policeman). Le faux magistrat (The false judge). Serial in four episodes. Released May 1914. Credits as above. Cast: as above; plus Mesnery (Marquis de Tergell), Martial (Ribonard). Film version of the twelfth Fantômas novel, Le magistrat cambrioleur (The burgler judge). The Surrealists were entranced by the multiple disguises, hairbreadth escapes, and graphic, unmotivated violence of the Fantômas novels and films. See Robin Walz's article "Serial Killings: Fantômas, Feuillade, and the Mass-Culture Genealogy of Surrealism" from The Velvet Light Trap: A Critical Journal of Film and Television. Fantômas. Produced by Fox, 1920-21. Directed by Edward Sedgwick. Serial in 20 episodes of 2 reels each. Cast: Edna Murphy, Edward Roseman, Eva Balfour, John Walker, Lionel Adams, John Willard, Irving Brooks. (from Walter Lee's Reference Guide To Fantastic Films, Chelsea-Lee Books, 1973, via Fantofan Tim Lucas). Fantômas. Produced by Braunberger-Richebé Studios, 1931. Directed by Paul Fejos. Robin Walz on the 1931 film: "Forget Fejos!" Fantômas. 1946. Directed by Jean Sacha. In her memoir, Nostalgia Isn't What It Used To Be, Signoret described this film as "...a modernist version, with helicopters, electronic gadgets and death rays." Click here for the 1946 film posters. Fantômas contre Fantômas. 1949. Directed by Robert Vernay. Fantômas. Produced by PAC/SNEG (Paris) and PCM (Rome), 1964. Directed by André Hunebelle. Screenplay by Jean Halain and Pierre Foucaud. Fantômas se déchaîne (Fantômas strikes back). 1965. Production credits and cast as above. Fantômas contre Scotland Yard. 1966. Production credits and cast as above. For information on the impact of the 1960s Fantômas films in Cuba, see the Notes from Friends. Gaumont has released Hunebelle's Fantômas movies both individually and as a three-disc DVD set in Canada and the U.S. (Region 1, NTSC) in French, without subtitles. Unfortunately, you cannot order it directly, but must go through a third party (preferably an independent DVD outlet rather than a mega-corporate vendor). L'Echafaud magique (The magic gallows). Produced by Claude Barma, directed by Claude Chabrol, adaptation and dialogue by Bernard Revon, music by Georges Delerue. 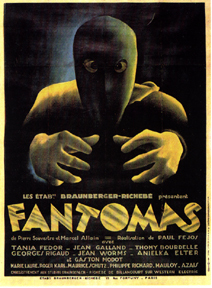 Based on the first Fantômas novel, Fantômas. L'Etriente du diable. Directed by Juan-Luis Buñuel; other production credits as above. 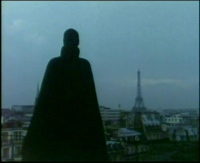 Based on the second Fantômas novel, Juve contre Fantômas. Le Mort qui tue (The murderous corpse). Directed by Juan-Luis Buñuel; other production credits as above. Based on the third Fantômas novel, Le Mort qui tue. Le Tramway fantôme (The phantom tramway). Directed by Claude Chabrol; other production credits as above. Based on the fifth Fantômas novel, Un roi prisonnier de Fantômas. 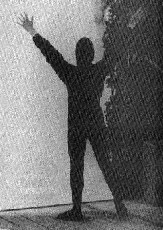 Information on the Hunebelle films and on the 1979 TV series kindly provided by Tim Lucas, publisher and editor of Video Watchdog magazine.